Paris Parks and Recreation is proud to announce that beginning February 18, 2013, youth tennis lessons will be offered to kids, ages 5 – 10, every Monday and Thursday, and ending on March 7, 2013. There will be a total of 6 sessions for $20. Equipment will be provided. Lessons will take place indoors at Atkins Porter Recreation Center in Paris, Tennessee. The lessons will be taught by instructor, J.F. Kirk. Kirk has over 40 years teaching experience, is a member of the United States Professional Tennis Association, a league coordinator for the United States Tennis Association, and president of the tennis club in Camden. He has experience coaching youth, juniors, and adult leagues. He volunteered as the tennis coach at Camden Central High School for six years. The goal of the 6 sessions is to introduce tennis to the children and begin teaching them the basic skills and principals of the game. Most importantly, the wish is for the kids to have fun and begin a love for the sport. For more information and to register, contact Tony Lawrence at (731) 644-2517. The Tennessee Wildlife Resources Agency delivered 500 trout from the Springfield Fish Hatchery to the Eiffel Tower Park Extended on Thursday, Jan 10th, 2013. Any person with a valid license and a trout stamp may fish in the pond. When accessing the pond, visitors should park at Eiffel Tower Park, off Volunteer Drive, and walk the short distance across the street to the pond. 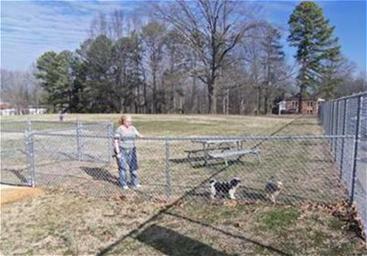 Tony Lawrence, Paris Parks & Recreation director, is pleased to announce the grand opening of the Paris Dog Park, located outside Aktins Porter Recreation Center in Paris, Tennessee. The grand opening ceremony will be held on Friday, March 16th at 10:00 a.m. Please make plans to attend with your favorite, friendly canine! Piranhas swim coach, Sarah Newbill, gives final instructions and words of encouragement to the 11-12 year old girls medley relay team right before their race. The team took second place! If Eiffel Tower Park were a business, its fourth quarter, would be defined as ‘Outstanding’. The last four months of 2011 have been good to the Paris Eiffel Tower Park. Back in September, the city park had its walking trail repaved and a commemorative sign added to its grounds, then a few weeks ago, the extended Eiffel Tower Park pond was fortunate to receive 500 trout from TWRA, and now the park is home to upgraded fitness equipment along the walking track. As the weather permits, park department personnel are installing the eight new pieces of equipment. Shock-absorbing protective chips are being placed under the new equipment to serve as a protective safety layer. 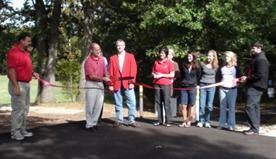 Eiffel Tower Park was fortunate to receive the equipment through the Recreational Trails Program (RTP) grant. 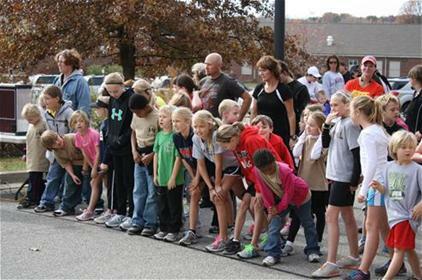 November 12, 2011 – Kids line up to start the 1-mile Kids’ Cumulative Marathon outside the Paris Civic Center. Gabby Pack and Hunter Lawrence, representing Paris Elementary School, were the first female and male to cross the finish line. 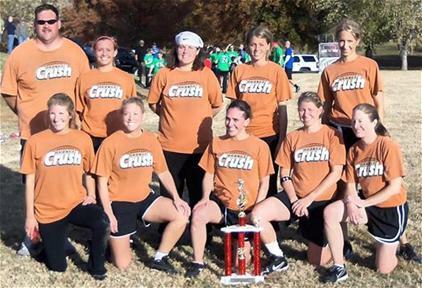 The Paris Parks and Rec flag football team, coached by Tony Lawrence, won first place (out of 6 teams) in the women’s division of the Fraternal Order of Police (FOP) flag football tournament on Saturday, Nov 5th, 2011. The FOP was able to raise enough money to take 35 youth shopping for Christmas. 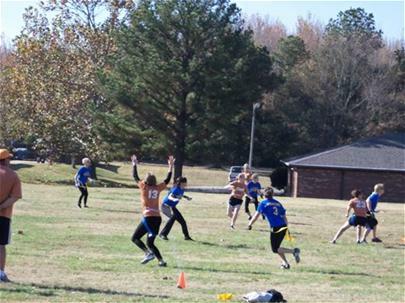 The Orange Crush in action! 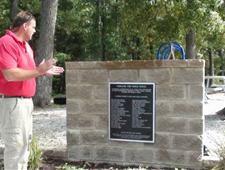 Parks & Rec Director, Tony Lawrence, admires the commemorative stone placed at Eiffel Tower Park, and honors the Families for Paris Parks for seeing this vision of an improved playground to completion. Attending the ceremony this day, from Families for Paris Parks, was president Kay Whitby, Leigh Ann Davis, and Amy Lawrence. In addition, during this ceremonious event, city, parks, and chamber officials were present for the ribbon-cutting ceremony to officially open the newly renovated walking/biking trail at Eiffel Tower Park. The trail was graded and expanded to eight feet wide and .75 miles long. This project was financed by a grant which Lawrence said “was an 80/20 match and with the city doing its own paving as our in-kind contribution, we came in under budget.” With this savings, the park will be able to upgrade the fitness equipment along the trail.